When I do a project, usually one thing leads to another, and then everything just gets completely out of hand. 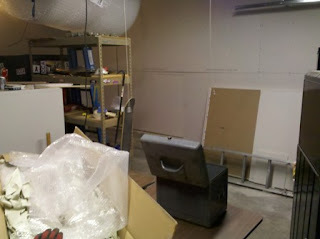 This is how my garage/studio ended up the way it is. 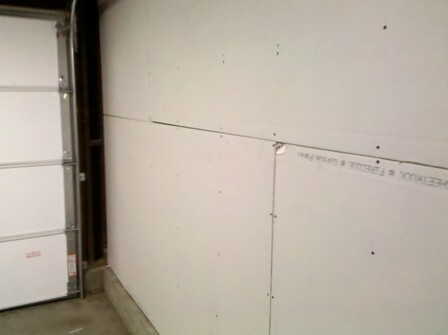 A few summers ago, my old wooden garage door broke and I decided that it was appropriate to get with the times and purchase a sectional steel garage door. This is how it all started. 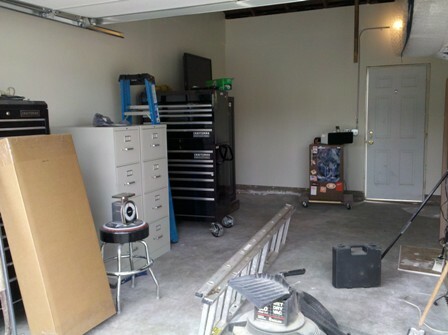 The garage door salesman came out, took one look at the garage and told me I had to tear out the heavy-duty wooden shelves and loft that I built 15 years before, as there would be no place for the garage door tracks to go. After he left, I looked around my garage and it was a cluttered mess. 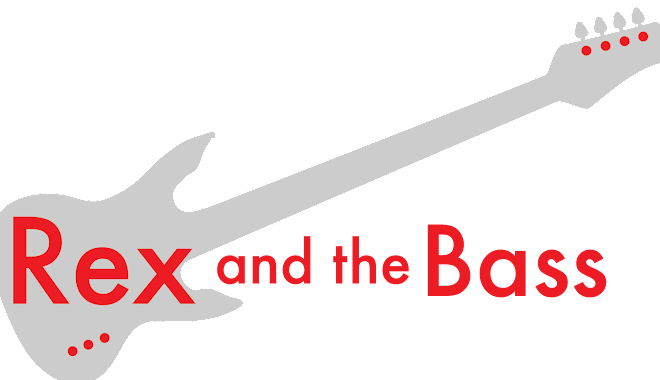 It was dark, and my drum set, tool boxes, bicycles and motorcycles took up a lot of real estate. I figured it was time to get a fresh start and just fix the place up a little. 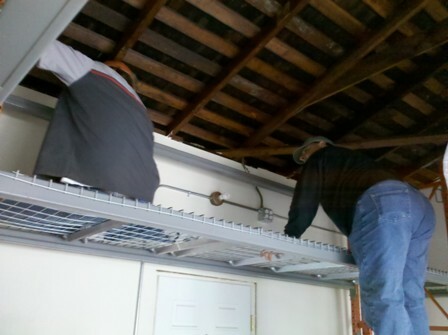 I moved everything out to a nearby vacant garage, and went about demolishing the shelves and loft, which was a huge deal because I wayyyy overbuilt them. 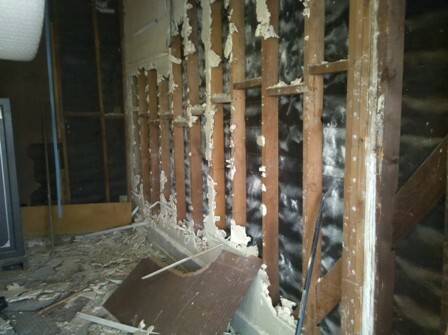 Then I looked at the crummy plaster firewall and tore it out with the intention of replacing it with drywall, and that would be the end of things. Then one of my friends came over, and when he saw the exposed studs and tarpaper all over the garage he advised that while I has everything cleared out, I should really do the job right. He has a beautiful 1,000 square foot garage, so I value his opinion. My wife concurred, and I plunged straight into the abyss. First off, he had me order the insulated garage door, so it would be quieter and look nicer on the inside. This was a wise choice, and the guys from Mesa garage doors had it installed in just a few hours. I elected to not install a new garage door opener, as I rarely open it to the street. Then, on his advice I ordered drywall for the entire garage, not just the firewall. This meant that I had to pull half a million nails out of the studs so it would lie flat. I guessed how many sheets I needed, then ordered it from Lowe’s and had the stack delivered to my driveway. The $75 delivery fee was the best money I ever spent. My buddy actually showed up to help me hang the drywall, and amazingly enough there was none left over. 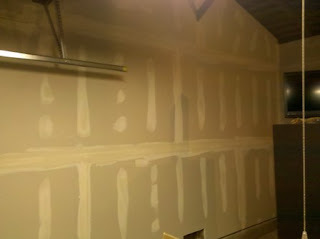 Then he asked when I was going to tape it and paint it and I said that I had not planned to do that. He shamed me into calling his nephew’s pot head friends that do drywall, and they showed up one evening to give me an estimate. I think they were drunk when they arrived. When I told them what I was looking for they said they could do the job that evening, and they headed off to buy materials and beer. They knocked the job out in no time. After I sanded and painted the walls, the electrician came out and ran conduit all over the garage (I love exposed conduit!) and installed new fluorescent fixtures and power outlets everywhere. 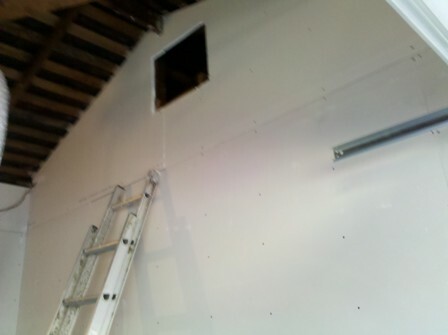 It is amazing how much brighter it was after the walls were painted and the new lights were in. Then came the shelving. This same friend has a contact that deals in surplus warehouse equipment, so I purchased pallet racks with wire grate shelves. They extend from floor to ceiling and cover three of the walls. 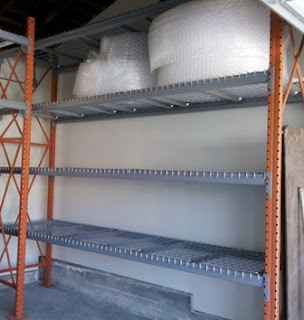 These are the strongest shelves I could find, and they are rated for 10,000 pounds per shelf. From then on it was just moving most of the stuff back in and doing the final finishing. I mounted a half dozen of the Hercules guitar wall hangers, put up my disco ball and spotlights, and it was good to go. 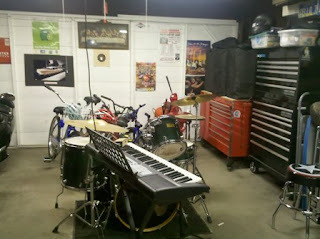 I am glad I took my friend’s advice, as the garage is a lot nicer place to practice, not to mention just hanging out. Remember, if you are going to do it – do it right the first time because you might not get a second chance!